Both Target and Walmart are featuring big baby item sales this week, with everything from strollers and cribs, to wipes, diapers and toys, being discounted. Here’s a few of the highlights from each. Both stores have quite a few more models available too. There are more sale prices available at Target as far as strollers go, but Walmart has some good basic prices highlighted in their baby sale section too. • Target has 20% off all activity gyms for babies. They range in price from $20 to $80 for more complex ones. 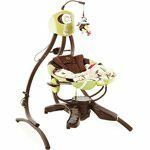 • Fisher Price cradle swings for $109 – $139 with a free $20 eGift card. Both Target and Walmart have some decently priced play yards starting at $50, but no particular specials. There are some pretty good specials here at both stores online, mostly in bulk. So unless your baby is actually here yet, it’s probably best to wait for diaper sizing! Remember to share these great specials with anyone who might have a little one (or one on the way!) using the sharing buttons below – and be sure to follow me by email for more upcoming deals!